I was working away from home at the time I took this photograph. I had been working all day and was tired. After relaxing in the hotel for a while I looked out of a window. The light was fading but magical and the air was almost completely still, a rare event on the Clyde. I nearly always have to hold on to my hat! At 10.05pm I climbed over the railings and balanced on the edge of the 20-30' wall to set up my tripod and take the shot. There was not a soul in sight. 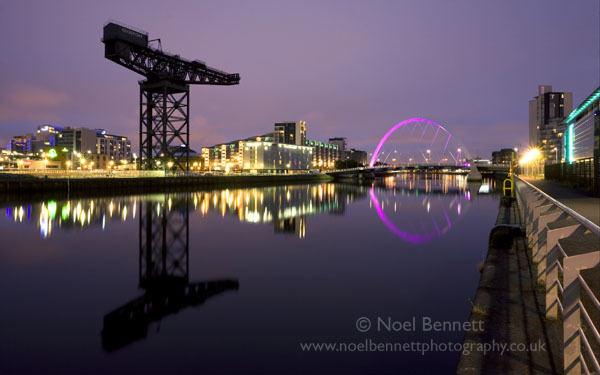 Not a night to fall into the Clyde! f/16 • 30sec • ISO50 • focal length 26mm • tripod • cable release • head for heights!